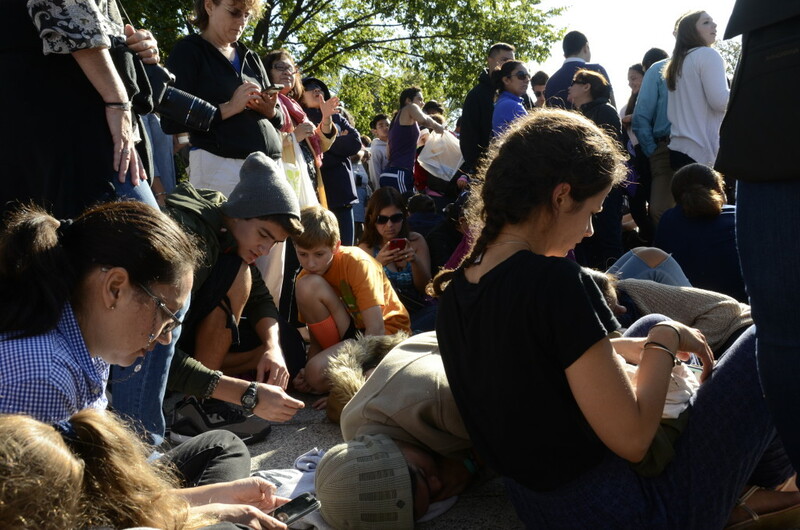 Before Pope Francis drove down Constitution Avenue to greet parade-goers, people kill time by eating snacks, checking phones and taking naps. For some, the wait was more than seven hours. SHFWire photo by Rebecca Anzel. WASHINGTON – Throwing her arm around her good friend’s neck, Cecilia Allen, 47, laughed conspiratorially about skipping school to see the pope. Allen is a French teacher at H-B Woodlawn in Arlington, Va. Her friend, Margaret Johnson, 40, is a Spanish teacher at Yorktown High School in the same city. “I can call at 11 o’clock and say, ‘Hey what are you doing tomorrow? I’m going to see the pope and you’re coming with me,” Allen said. Allen and Johnson were two of thousands of people who attended the brief parade Wednesday, watching Pope Francis make his way along the streets circling the White House South Lawn. The parade followed the arrival ceremony with President Barack Obama. Pope Francis’ visit to the United States comes after a brief stay in Cuba, and after leaving D.C. on Thursday, he will continue to New York and Philadelphia. Not all of the parade-goers came from D.C. or the surrounding areas. For some, it was a journey of hundreds of miles. Gru Tejeda, 40,who works in criminal justice, had to plan her roughly 1,400 mile voyage from Houston, carefully, she said. She left at 6 a.m. Monday and arrived in D.C. at 9:30 the following night. She said she made the trip mainly because her mother, Socorro Soriano, 59, was eager to see Pope Francis. Sylvia Zimmer, 28, a kindergarten teacher, and Sebastian Brand, 35, a welder, were in Philadelphia when they heard the pope would be in D.C. The residents of Chemnitz, Germany, made a detour in their 11-day U.S. trip to see Pope Francis. “It’s a once-in-a-lifetime chance to see him,” Zimmer said. Despite the thousands of people drawn to the parade route, some said they were shocked the grounds were not more crowded. Johnson said she was also expecting more people to be at the parade. She said she found the security process was not as long as she thought it would be. Some people lined up outside the parade’s security checkpoint as early as 3:30 a.m. in hopes of seeing the pope they believe is making a real difference. An actress and musician, Christina Castellanos, 32, came from Somerville, N.J., to sell buttons, posters and T-shirts to commemorate the pope’s visit. She said she plans to donate the profits to her church, and the experience of seeing Pope Francis is one “that will last a lifetime” in part because of his positive effect on people. Teachers Johnson and Allen spent a few minutes after the parade ended to flip through the photos they took. They gushed over one that shows the pope waving in their direction and other parade-goers’ hands straining toward the sky almost in a plea for Pope Francis to bless them with his touch. Reach reporter Jessica Pereda at jessica.pereda@scripps.com or 202-408-1493 and reporter Rebecca Anzel at rebecca.anzel@scripps.com or 202-408-1489. SHFWire stories are free to any news organization that gives the reporter a byline and credits the SHFWire. Like the Scripps Howard Foundation Wire interns on Facebook and follow us on Twitter and Instagram.